Place roast in a roasting pan. Combine remaining ingredients; spread over and around roast. Cover and roast in a 325°F (160°C) oven for 3-1/2 hours. Remove roast to a cutting board. With 2 forks, pull meat into shreds, discarding any fat. Transfer shredded pork to a casserole dish. Pour cooking liquid into a measuring cup and remove any fat. Pour degreased liquid over pork. Cover and bake another 45 minutes. 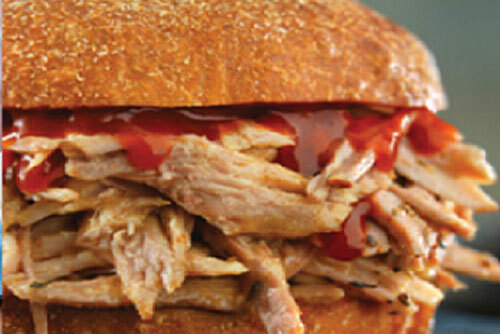 To serve, layer onto Kaiser Rolls and top with cole slaw if desired.